The KnowledgeBuilder is responsible for taking source files, such as a DRL file or an Excel file, and turning them into a Knowledge Package of rule and process definitions which a Knowledge Base can consume. An object of the class ResourceType indicates the type of resource the builder is being asked to process. The ResourceFactory provides capabilities to load resources from a number of sources, such as a java.io.Reader, the classpath, a URL, a java.io.File, or a byte array. Binary files, such as decision tables (Excel's' .xls files), should not be passed in with Reader, which is only suitable for text based resources. The KnowledgeBuilder is created using the KnowledgeBuilderFactory. A KnowledgeBuilder can be created using the default configuration. 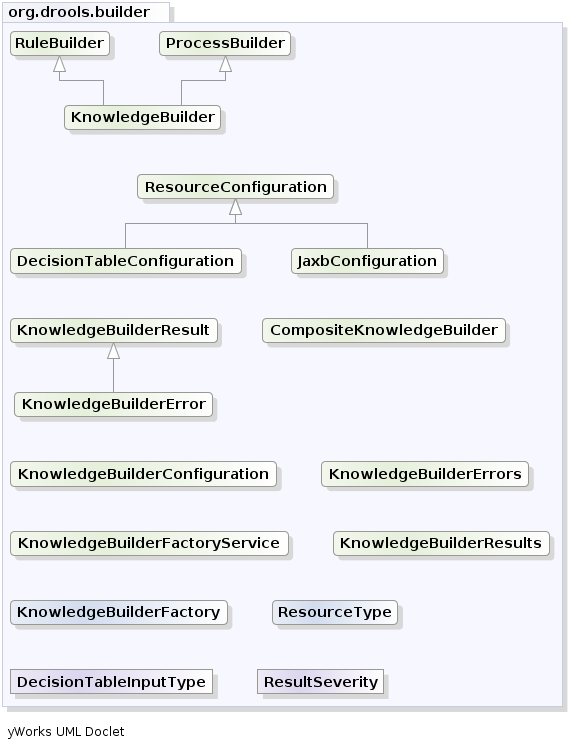 A configuration can be created using the KnowledgeBuilderFactory. This allows the behavior of the Knowledge Builder to be modified. The most common usage is to provide a custom class loader so that the KnowledgeBuilder object can resolve classes that are not in the default classpath. The first parameter is for properties and is optional, i.e., it may be left null, in which case the default options will be used. The options parameter can be used for things like changing the dialect or registering new accumulator functions. Resources of any type can be added iteratively. Below, a DRL file is added. The Knowledge Builder can handle multiple namespaces, so you can combine resources regardless of their namespace. It is a best practice to check the compilation results after each resource addition. The KnowledgeBuilder can report compilation results of 3 different severities: ERROR, WARNING and INFO. An ERROR indicates that the compilation of the resource failed. You should not add more resources or retrieve the Knowledge Packages if there are errors. getKnowledgePackages() returns an empty list if there are errors. WARNING and INFO results can be ignored, but are available for inspection nonetheless. * Return the knowledge builder results for the listed severities. When all the resources have been added and there are no errors the collection of Knowledge Packages can be retrieved. It is a java.util.Collection because there is one KnowledgePackage per package namespace. These Knowledge Packages are serializable and often used as a unit of deployment. The final example puts it all together. In this way it is no longer necessary to build the DRL files in the right order (e.g., first the DRLs containing the type declarations and then the ones with the rules using them) and it will also be possible to have circular references among them. Moreover, the KnowledgeBuilder (regardless if you are using the batch mode or not) also allows to discard what has been added with the last DRL(s) build. 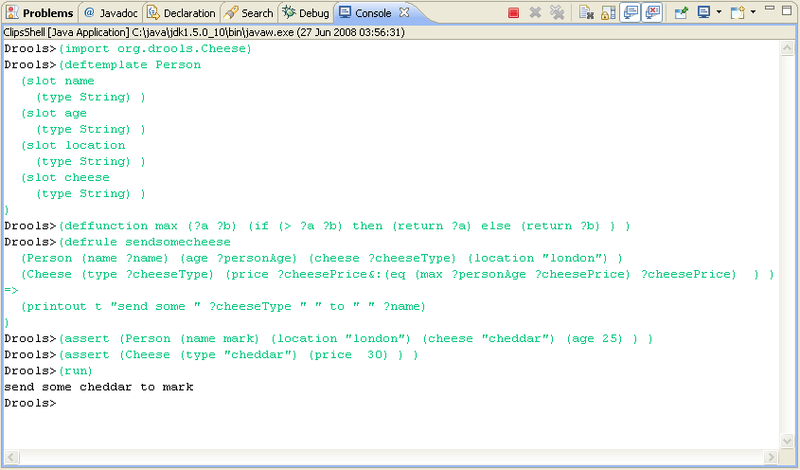 This can be useful to recover from having added an erroneous DRL to the KnowledgeBuilder, as shown below. Instead of adding the resources to create definitions programmatically it is also possible to do it by configuration, via the ChangeSet XML. The simple XML file supports three elements: add, remove, and modify, each of which has a sequence of <resource> subelements defining a configuration entity. The following XML schema is not normative and intended for illustration only. Currently only the add element is supported, but the others will be implemented to support iterative changes. The following example loads a single DRL file. Notice the file: prefix, which signifies the protocol for the resource. The Change Set supports all the protocols provided by java.net.URL, such as "file" and "http", as well as an additional "classpath". Currently the type attribute must always be specified for a resource, as it is not inferred from the file name extension. Using the ClassPath resource loader in Java allows you to specify the Class Loader to be used to locate the resource but this is not possible from XML. Instead, the Class Loader will default to the one used by the Knowledge Builder unless the ChangeSet XML is itself loaded by the ClassPath resource, in which case it will use the Class Loader specified for that resource. Currently you still need to use the API to load that ChangeSet, but we will add support for containers such as Spring in the future, so that the process of creating a Knowledge Base can be done completely by XML configuration. Loading resources using an XML file couldn't be simpler, as it's just another resource type. Change Sets can include any number of resources, and they even support additional configuration information, which currently is only needed for decision tables. Below, the example is expanded to load rules via HTTP from a URL location, and an Excel decision table from the classpath. The Change Set is especially useful when working with a Knowledge Agent, as it allows for change notification and automatic rebuilding of the Knowledge Base, which is covered in more detail in the section on the Knowledge Agent, under Deploying. Directories can also be specified, to add all resources in that folder. Currently it is expected that all resources in that folder are of the same type. If you use the Knowledge Agent it will provide a continous scanning for added, modified or removed resources and rebuild the cached Knowledge Base. The KnowledgeAgent provides more information on this. In some cases, it is possible to change the default severity of a type of build result. For instance, when a new rule with the same name of an existing rule is added to a package, the default behavior is to replace the old rule by the new rule and report it as an INFO. This is probably ideal for most use cases, but in some deployments the user might want to prevent the rule update and report it as an error. A Knowledge Package is a collection of Knowledge Definitions, such as rules and processes. It is created by the Knowledge Builder, as described in the chapter "Building". Knowledge Packages are self-contained and serializable, and they currently form the basic deployment unit. Knowledge Packages are added to the Knowledge Base. However, a Knowledge Package instance cannot be reused once it's added to the Knowledge Base. If you need to add it to another Knowledge Base, try serializing it first and using the "cloned" result. We hope to fix this limitation in future versions of Drools. The Knowledge Base is a repository of all the application's knowledge definitions. It may contain rules, processes, functions, and type models. The Knowledge Base itself does not contain instance data, known as facts; instead, sessions are created from the Knowledge Base into which data can be inserted and where process instances may be started. Creating the Knowledge Base can be heavy, whereas session creation is very light, so it is recommended that Knowledge Bases be cached where possible to allow for repeated session creation. A KnowledgeBase object is also serializable, and some people may prefer to build and then store a KnowledgeBase, treating it also as a unit of deployment, instead of the Knowledge Packages. The KnowledgeBase is created using the KnowledgeBaseFactory. A KnowledgeBase can be created using the default configuration. If a custom class loader was used with the KnowledgeBuilder to resolve types not in the default class loader, then that must also be set on the KnowledgeBase. The technique for this is the same as with the KnowledgeBuilder. This is the simplest form of deployment. 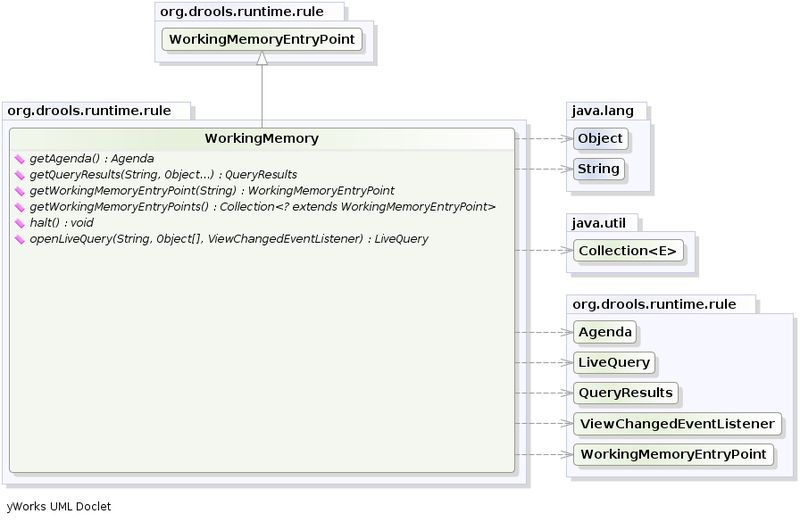 It compiles the knowledge definitions and adds them to the Knowledge Base in the same JVM. This approach requires drools-core.jar and drools-compiler.jar to be on the classpath. Note that the addKnowledgePackages(kpkgs) method can be called iteratively to add additional knowledge. Both the KnowledgeBase and the KnowledgePackage are units of deployment and serializable. This means you can have one machine do any necessary building, requiring drools-compiler.jar, and have another machine deploy and execute everything, needing only drools-core.jar. Although serialization is standard Java, we present an example of how one machine might write out the deployment unit and how another machine might read in and use that deployment unit. // package or a collection. The KnowledgeBase is also serializable and some people may prefer to build and then store the KnowledgeBase itself, instead of the Knowledge Packages. Drools Guvnor, our server side management system, uses this deployment approach. After Guvnor has compiled and published serialized Knowledge Packages on a URL, Drools can use the URL resource type to load them. Stateful Knowledge Sessions will be discussed in more detail in section "Running". The KnowledgeBase creates and returns StatefulKnowledgeSession objects, and it may optionally keep references to those. When KnowledgeBase modifications occur those modifications are applied against the data in the sessions. This reference is a weak reference and it is also optional, which is controlled by a boolean flag. The KnowlegeAgent provides automatic loading, caching and re-loading of resources and is configured from a properties files. The Knowledge Agent can update or rebuild this Knowlege Base as the resources it uses are changed. The strategy for this is determined by the configuration given to the factory, but it is typically pull-based using regular polling. We hope to add push-based updates and rebuilds in future versions. The Knowledge Agent will continuously scan all the added resources, using a default polling interval of 60 seconds. If their date of the last modification is updated it will rebuild the cached Knowledge Base using the new resources. 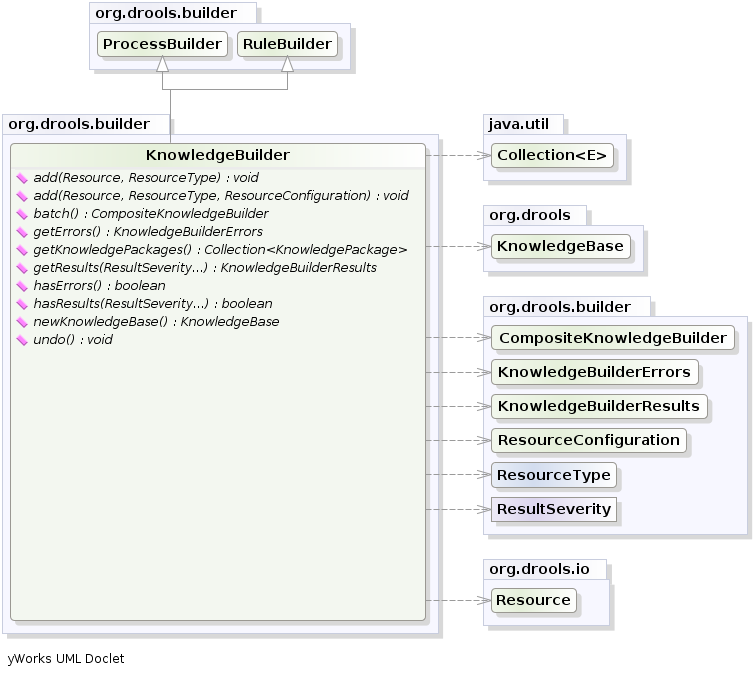 The KnowlegeBuilder is created using a KnowledgeBuilderFactory object. The agent must specify a name, which is used in the log files to associate a log entry with the corresponding agent. 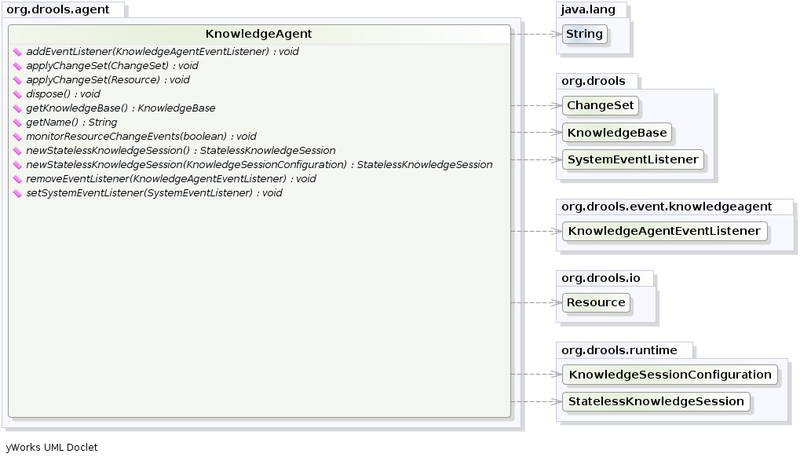 The following example constructs an agent that will build a new KnowledgeBase from the specified ChangeSet. (See section "Building" for more details on the ChangeSet format.) Note that the method can be called iteratively to add new resources over time. The Knowledge Agent polls the resources added from the ChangeSet every 60 seconds, the default interval, to see if they are updated. Whenever changes are found it will construct a new Knowledge Base or apply the modifications to the existing Knowledge Base according to its configuration. If the change set specifies a resource that is a directory its contents will be scanned for changes, too. Resource scanning is not on by default, it's a service and must be started, and the same is true for notification. Both can be done via the ResourceFactory. The default resource scanning period may be changed via the ResourceChangeScannerService. A suitably updated ResourceChangeScannerConfiguration object is passed to the service's configure() method, which allows for the service to be reconfigured on demand. // Set the disk scanning interval to 30s, default is 60s. Knowledge Agents can take an empty Knowledge Base or a populated one. If a populated Knowledge Base is provided, the Knowledge Agent will run an iterator from Knowledge Base and subscribe to the resources that it finds. While it is possible for the Knowledge Builder to build all resources found in a directory, that information is lost by the Knowledge Builder so that those directories will not be continuously scanned. Only directories specified as part of the applyChangeSet(Resource) method are monitored. One of the advantages of providing KnowledgeBase as the starting point is that you can provide it with a KnowledgeBaseConfiguration. When resource changes are detected and a new KnowledgeBase object is instantiated, it will use the KnowledgeBaseConfiguration of the previous KnowledgeBase object. // Populate kbase with resources here. In the above example getKnowledgeBase() will return the same provided kbase instance until resource changes are detected and a new Knowledge Base is built. When the new Knowledge Base is built, it will be done with the KnowledgeBaseConfiguration that was provided to the previous KnowledgeBase. As mentioned previously, a ChangeSet XML can specify a directory and all of its contents will be added. If this ChangeSet XML is used with the applyChangeSet() method it will also add any directories to the scanning process. When the directory scan detects an additional file, it will be added to the Knowledge Base; any removed file is removed from the Knowledge Base, and modified files will be removed from the Knowledge Base. Note that for the resource type PKG the drools-compiler dependency is not needed as the Knowledge Agent is able to handle those with just drools-core. 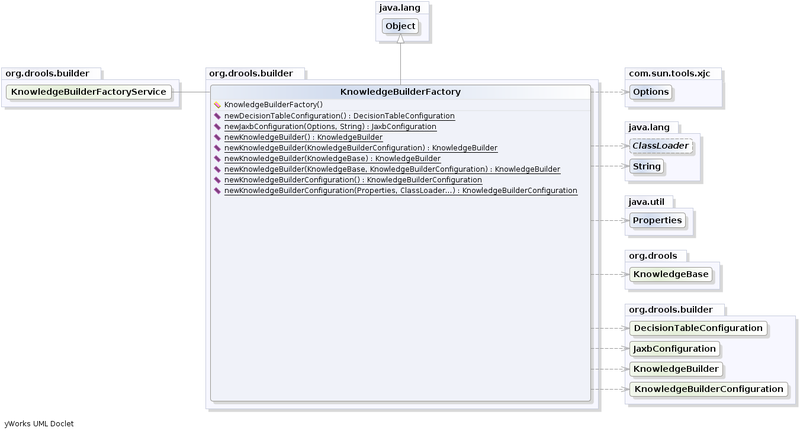 The KnowledgeAgentConfiguration can be used to modify a Knowledge Agent's default behavior. You could use this to load the resources from a directory, while inhibiting the continuous scan for changes of that directory. // Do not scan directories, just files. Previously we mentioned Drools Guvnor and how it can build and publish serialized Knowledge Packages on a URL, and that the ChangeSet XML can handle URLs and Packages. Taken together, this forms an importanty deployment scenario for the Knowledge Agent. The KnowledgeBase is a repository of all the application's knowledge definitions. It will contain rules, processes, functions, and type models. The Knowledge Base itself does not contain data; instead, sessions are created from the KnowledgeBase into which data can be inserted and from which process instances may be started. Creating the KnowledgeBase can be heavy, whereas session creation is very light, so it is recommended that KnowledgeBases be cached where possible to allow for repeated session creation. The StatefulKnowledgeSession stores and executes on the runtime data. It is created from the KnowledgeBase. The WorkingMemoryEntryPoint provides the methods around inserting, updating and retrieving facts. The term "entry point" is related to the fact that we have multiple partitions in a Working Memory and you can choose which one you are inserting into, although this use case is aimed at event processing and covered in more detail in the Fusion manual. Most rule based applications will work with the default entry point alone. The KnowledgeRuntime interface provides the main interaction with the engine. It is available in rule consequences and process actions. In this manual the focus is on the methods and interfaces related to rules, and the methods pertaining to processes will be ignored for now. But you'll notice that the KnowledgeRuntime inherits methods from both the WorkingMemory and the ProcessRuntime, thereby providing a unified API to work with processes and rules. When working with rules, three interfaces form the KnowledgeRuntime: WorkingMemoryEntryPoint, WorkingMemory and the KnowledgeRuntime itself. Insertion is the act of telling the WorkingMemory about a fact, which you do by ksession.insert(yourObject), for example. When you insert a fact, it is examined for matches against the rules. This means all of the work for deciding about firing or not firing a rule is done during insertion; no rule, however, is executed until you call fireAllRules(), which you call after you have finished inserting your facts. It is a common misunderstanding for people to think the condition evaluation happens when you call fireAllRules(). Expert systems typically use the term assert or assertion to refer to facts made available to the system. However, due to "assert" being a keyword in most languages, we have decided to use the insert keyword; however, expect to hear the two terms used interchangeably. When an Object is inserted it returns a FactHandle. This FactHandle is the token used to represent your inserted object within the WorkingMemory. It is also used for interactions with the WorkingMemory when you wish to retract or modify an object. As mentioned in the Knowledge Base section, a Working Memory may operate in two assertion modes, i.e., equality or identity, with identity being the default. Identity means that the Working Memory uses an IdentityHashMap to store all asserted objects. New instance assertions always result in the return of new FactHandle, but if an instance is asserted again then it returns the original fact handle, i.e., it ignores repeated insertions for the same object. Equality means that the Working Memory uses a HashMap to store all asserted objects. An object instance assertion will only return a new FactHandle if the inserted object is not equal (according to its equal method) to an already existing fact. Retraction is the removal of a fact from Working Memory, which means that it will no longer track and match that fact, and any rules that are activated and dependent on that fact will be cancelled. Note that it is possible to have rules that depend on the nonexistence of a fact, in which case retracting a fact may cause a rule to activate. (See the not and exists keywords.) Retraction may be done using the FactHandle that was returned by the insert call. On the right hand side of a rule the retract statement is used, which works with a simple object reference. The Rule Engine must be notified of modified facts, so that they can be reprocessed. You must use the update() method to notify the WorkingMemory of changed objects for those objects that are not able to notify the WorkingMemory themselves. Notice that update() always takes the modified object as a second parameter, which allows you to specify new instances for immutable objects. On the right hand side of a rule the modify statement is recommended, as it makes the changes and notifies the engine in a single statement. Alternatively, after changing a fact object's field values through calls of setter methods you must invoke update immediately, event before changing another fact, or you will cause problems with the indexing within the rule engine. The modify statement avoids this problem. The WorkingMemory provides access to the Agenda, permits query executions, and lets you access named Entry Points. Queries are used to retrieve fact sets based on patterns, as they are used in rules. Patterns may make use of optional parameters. Queries can be defined in the Knowledge Base, from where they are called up to return the matching results. While iterating over the result collection, any identifier bound in the query can be used to access the corresponding fact or fact field by calling the get method with the binding variable's name as its argument. If the binding refers to a fact object, its FactHandle can be retrieved by calling getFactHandle, again with the variable's name as the parameter. Invoking queries and processing the results by iterating over the returned set is not a good way to monitor changes over time. To alleviate this, Drools provides Live Queries, which have a listener attached instead of returning an iterable result set. These live queries stay open by creating a view and publishing change events for the contents of this view. To activate, you start your query with parameters and listen to changes in the resulting view. The dispose method terminates the query and discontinues this reactive scenario. Globals are named objects that are made visible to the rule engine, but in a way that is fundamentally different from the one for facts: changes in the object backing a global do not trigger reevaluation of rules. Still, globals are useful for providing static information, as an object offering services that are used in the RHS of a rule, or as a means to return objects from the rule engine. When you use a global on the LHS of a rule, make sure it is immutable, or, at least, don't expect changes to have any effect on the behavior of your rules. A global must be declared in a rules file, and then it needs to be backed up with a Java object. With the Knowledge Base now aware of the global identifier and its type, it is now possible to call ksession.setGlobal() with the global's name and an object, for any session, to associate the object with the global. Failure to declare the global type and identifier in DRL code will result in an exception being thrown from this call. Make sure to set any global before it is used in the evaluation of a rule. Failure to do so results in a NullPointerException. The StatefulRuleSession is inherited by the StatefulKnowledgeSession and provides the rule related methods that are relevant from outside of the engine. AgendaFilter objects are optional implementations of the filter interface which are used to allow or deny the firing of an activation. What you filter on is entirely up to the implementation. Drools 4.0 used to supply some out of the box filters, which have not be exposed in drools 5.0 knowledge-api, but they are simple to implement and the Drools 4.0 code base can be referred to. To use a filter specify it while calling fireAllRules(). The following example permits only rules ending in the string "Test". All others will be filtered out. The Agenda is a Rete feature. During actions on the WorkingMemory, rules may become fully matched and eligible for execution; a single Working Memory Action can result in multiple eligible rules. When a rule is fully matched an Activation is created, referencing the rule and the matched facts, and placed onto the Agenda. The Agenda controls the execution order of these Activations using a Conflict Resolution strategy. Working Memory Actions. This is where most of the work takes place, either in the Consequence (the RHS itself) or the main Java application process. 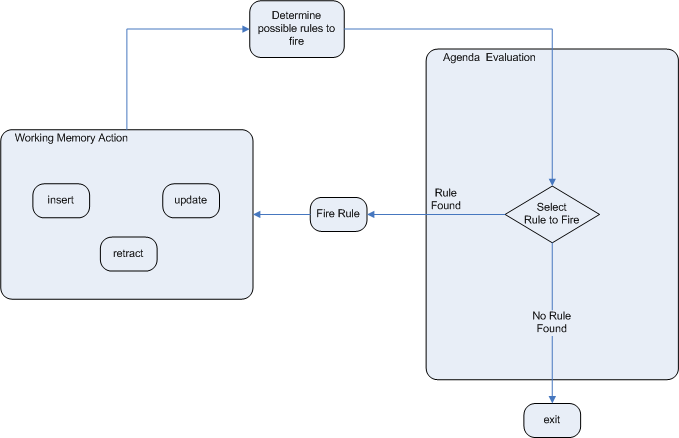 Once the Consequence has finished or the main Java application process calls fireAllRules() the engine switches to the Agenda Evaluation phase. Agenda Evaluation. This attempts to select a rule to fire. If no rule is found it exits, otherwise it fires the found rule, switching the phase back to Working Memory Actions. The process repeats until the agenda is clear, in which case control returns to the calling application. When Working Memory Actions are taking place, no rules are being fired. Conflict resolution is required when there are multiple rules on the agenda. (The basics to this are covered in chapter "Quick Start".) As firing a rule may have side effects on the working memory, the rule engine needs to know in what order the rules should fire (for instance, firing ruleA may cause ruleB to be removed from the agenda). The default conflict resolution strategies employed by Drools are: Salience and LIFO (last in, first out). The most visible one is salience (or priority), in which case a user can specify that a certain rule has a higher priority (by giving it a higher number) than other rules. In that case, the rule with higher salience will be preferred. LIFO priorities are based on the assigned Working Memory Action counter value, with all rules created during the same action receiving the same value. The execution order of a set of firings with the same priority value is arbitrary. As a general rule, it is a good idea not to count on rules firing in any particular order, and to author the rules without worrying about a "flow". However when a flow is needed a number of possibilities exist, including but not limited to: agenda groups, rule flow groups, activation groups, control/semaphore facts. These are discussed in later sections. 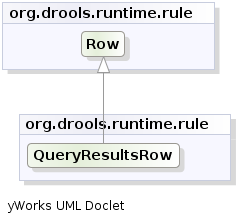 Drools 4.0 supported custom conflict resolution strategies; while this capability still exists in Drools it has not yet been exposed to the end user via knowledge-api in Drools 5.0. Agenda groups are a way to partition rules (activations, actually) on the agenda. At any one time, only one group has "focus" which means that activations for rules in that group only will take effect. You can also have rules with "auto focus" which means that the focus is taken for its agenda group when that rule's conditions are true. Agenda groups are known as "modules" in CLIPS terminology. While it best to design rules that do not need control flow, this is not always possible. Agenda groups provide a handy way to create a "flow" between grouped rules. You can switch the group which has focus either from within the rule engine, or via the API. If your rules have a clear need for multiple "phases" or "sequences" of processing, consider using agenda-groups for this purpose. Each time setFocus() is called it pushes that Agenda Group onto a stack. When the focus group is empty it is popped from the stack and the focus group that is now on top evaluates. An Agenda Group can appear in multiple locations on the stack. The default Agenda Group is "MAIN", with all rules which do not specify an Agenda Group being in this group. It is also always the first group on the stack, given focus initially, by default. An activation group is a set of rules bound together by the same "activation-group" rule attribute. In this group only one rule can fire, and after that rule has fired all the other rules are cancelled from the agenda. The clear() method can be called at any time, which cancels all of the activations before one has had a chance to fire. A rule flow group is a group of rules associated by the "ruleflow-group" rule attribute. These rules can only fire when the group is activate. The group itself can only become active when the elaboration of the ruleflow diagram reaches the node representing the group. Here too, the clear() method can be called at any time to cancels all activations still remaining on the Agenda. The event package provides means to be notified of rule engine events, including rules firing, objects being asserted, etc. This allows you, for instance, to separate logging and auditing activities from the main part of your application (and the rules). 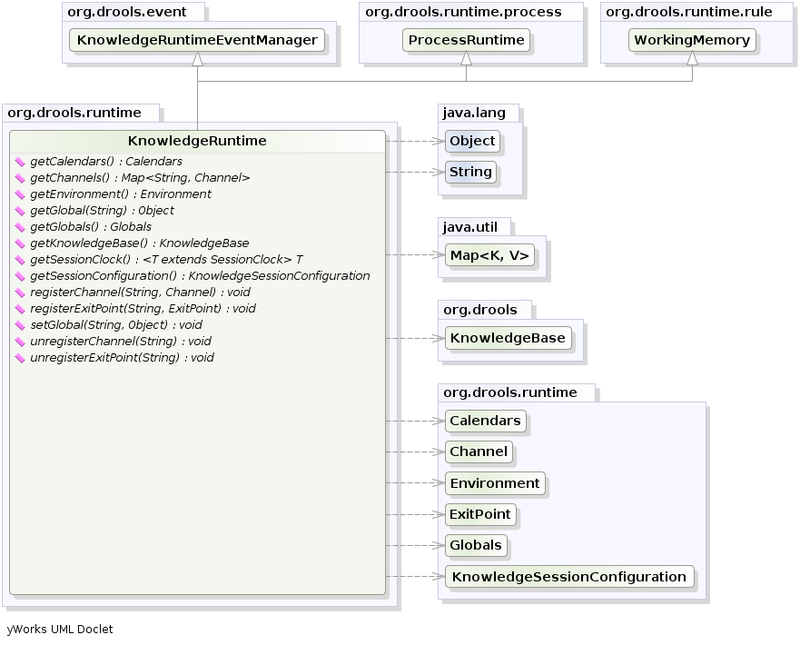 The KnowlegeRuntimeEventManager interface is implemented by the KnowledgeRuntime which provides two interfaces, WorkingMemoryEventManager and ProcessEventManager. We will only cover the WorkingMemoryEventManager here. The WorkingMemoryEventManager allows for listeners to be added and removed, so that events for the working memory and the agenda can be listened to. The following code snippet shows how a simple agenda listener is declared and attached to a session. It will print activations after they have fired. All emitted events implement the KnowlegeRuntimeEvent interface which can be used to retrieve the actual KnowlegeRuntime the event originated from. The KnowledgeRuntimeLogger uses the comprehensive event system in Drools to create an audit log that can be used to log the execution of an application for later inspection, using tools such as the Eclipse audit viewer. The StatelessKnowledgeSession wraps the StatefulKnowledgeSession, instead of extending it. Its main focus is on decision service type scenarios. It avoids the need to call dispose(). Stateless sessions do not support iterative insertions and the method call fireAllRules() from Java code; the act of calling execute() is a single-shot method that will internally instantiate a StatefulKnowledgeSession, add all the user data and execute user commands, call fireAllRules(), and then call dispose(). While the main way to work with this class is via the BatchExecution (a subinterface of Command) as supported by the CommandExecutor interface, two convenience methods are provided for when simple object insertion is all that's required. The CommandExecutor and BatchExecution are talked about in detail in their own section. 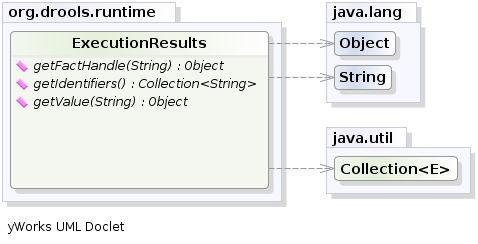 Our simple example shows a stateless session executing a given collection of Java objects using the convenience API. It will iterate the collection, inserting each element in turn. If you wanted to insert the collection itself, and the collection's individual elements, then CommandFactory.newInsert(collection) would do the job. Methods of the CommandFactory create the supported commands, all of which can be marshalled using XStream and the BatchExecutionHelper. BatchExecutionHelper provides details on the XML format as well as how to use Drools Pipeline to automate the marshalling of BatchExecution and ExecutionResults. StatelessKnowledgeSession supports globals, scoped in a number of ways. I'll cover the non-command way first, as commands are scoped to a specific execution call. Globals can be resolved in three ways. The Stateless Knowledge Session method getGlobals() returns a Globals instance which provides access to the session's globals. These are shared for all execution calls. Exercise caution regarding mutable globals because execution calls can be executing simultaneously in different threads. // Set a global hbnSession, that can be used for DB interactions in the rules. // Execute while being able to resolve the "hbnSession" identifier. Using a delegate is another way of global resolution. Assigning a value to a global (with setGlobal(String, Object)) results in the value being stored in an internal collection mapping identifiers to values. Identifiers in this internal collection will have priority over any supplied delegate. Only if an identifier cannot be found in this internal collection, the delegate global (if any) will be used. The third way of resolving globals is to have execution scoped globals. Here, a Command to set a global is passed to the CommandExecutor. The CommandExecutor interface also offers the ability to export data via "out" parameters. Inserted facts, globals and query results can all be returned. // Retrieve the query as a QueryResults instance. With Rete you have a stateful session where objects can be asserted and modified over time, and where rules can also be added and removed. Now what happens if we assume a stateless session, where after the initial data set no more data can be asserted or modified and rules cannot be added or removed? Certainly it won't be necessary to re-evaluate rules, and the engine will be able to operate in a simplified way. Order the Rules by salience and position in the ruleset (by setting a sequence attribute on the rule terminal node). Create an array, one element for each possible rule activation; element position indicates firing order. Turn off all node memories, except the right-input Object memory. Disconnect the Left Input Adapter Node propagation, and let the Object plus the Node be referenced in a Command object, which is added to a list on the Working Memory for later execution. Assert all objects, and, when all assertions are finished and thus right-input node memories are populated, check the Command list and execute each in turn. All resulting Activations should be placed in the array, based upon the determined sequence number of the Rule. Record the first and last populated elements, to reduce the iteration range. Iterate the array of Activations, executing populated element in turn. If we have a maximum number of allowed rule executions, we can exit our network evaluations early to fire all the rules in the array. The LeftInputAdapterNode no longer creates a Tuple, adding the Object, and then propagate the Tuple – instead a Command object is created and added to a list in the Working Memory. This Command object holds a reference to the LeftInputAdapterNode and the propagated object. This stops any left-input propagations at insertion time, so that we know that a right-input propagation will never need to attempt a join with the left-inputs (removing the need for left-input memory). All nodes have their memory turned off, including the left-input Tuple memory but excluding the right-input object memory, which means that the only node remembering an insertion propagation is the right-input object memory. Once all the assertions are finished and all right-input memories populated, we can then iterate the list of LeftInputAdatperNode Command objects calling each in turn. They will propagate down the network attempting to join with the right-input objects, but they won't be remembered in the left input as we know there will be no further object assertions and thus propagations into the right-input memory. There is no longer an Agenda, with a priority queue to schedule the Tuples; instead, there is simply an array for the number of rules. The sequence number of the RuleTerminalNode indicates the element within the array where to place the Activation. Once all Command objects have finished we can iterate our array, checking each element in turn, and firing the Activations if they exist. To improve performance, we remember the first and the last populated cell in the array. The network is constructed, with each RuleTerminalNode being given a sequence number based on a salience number and its order of being added to the network. Typically the right-input node memories are Hash Maps, for fast object retraction; here, as we know there will be no object retractions, we can use a list when the values of the object are not indexed. For larger numbers of objects indexed Hash Maps provide a performance increase; if we know an object type has only a few instances, indexing is probably not advantageous, and a list can be used. Sequential mode can only be used with a Stateless Session and is off by default. To turn it on, either call RuleBaseConfiguration.setSequential(true), or set the rulebase configuration property drools.sequential to true. Sequential mode can fall back to a dynamic agenda by calling setSequentialAgenda with SequentialAgenda.DYNAMIC. You may also set the "drools.sequential.agenda" property to "sequential" or "dynamic". Drools has the concept of stateful or stateless sessions. We've already covered stateful sessions, which use the standard working memory that can be worked with iteratively over time. Stateless is a one-off execution of a working memory with a provided data set. It may return some results, with the session being disposed at the end, prohibiting further iterative interactions. You can think of stateless as treating a rule engine like a function call with optional return results. In Drools 4 we supported these two paradigms but the way the user interacted with them was different. StatelessSession used an execute(...) method which would insert a collection of objects as facts. StatefulSession didn't have this method, and insert used the more traditional insert(...) method. The other issue was that the StatelessSession did not return any results, so that users themselves had to map globals to get results, and it wasn't possible to do anything besides inserting objects; users could not start processes or execute queries. InsertObject will insert a single object, with an optional "out" identifier. InsertElements will iterate an Iterable, inserting each of the elements. What this means is that a Stateless Knowledge Session is no longer limited to just inserting objects, it can now start processes or execute queries, and do this in any order. The execute method always returns an ExecutionResults instance, which allows access to any command results if they specify an out identifier such as the "stilton_id" above. The execute method only allows for a single command. That's where BatchExecution comes in, which represents a composite command, created from a list of commands. Now, execute will iterate over the list and execute each command in turn. This means you can insert some objects, start a process, call fireAllRules and execute a query, all in a single execute(...) call, which is quite powerful. As mentioned previosly, the Stateless Knowledge Session will execute fireAllRules() automatically at the end. However the keen-eyed reader probably has already noticed the FireAllRules command and wondered how that works with a StatelessKnowledgeSession. The FireAllRules command is allowed, and using it will disable the automatic execution at the end; think of using it as a sort of manual override function. Commands support out identifiers. Any command that has an out identifier set on it will add its results to the returned ExecutionResults instance. Let's look at a simple example to see how this works. In the above example multiple commands are executed, two of which populate the ExecutionResults. The query command defaults to use the same identifier as the query name, but it can also be mapped to a different identifier. A custom XStream marshaller can be used with the Drools Pipeline to achieve XML scripting, which is perfect for services. Here are two simple XML samples, one for the BatchExecution and one for the ExecutionResults. 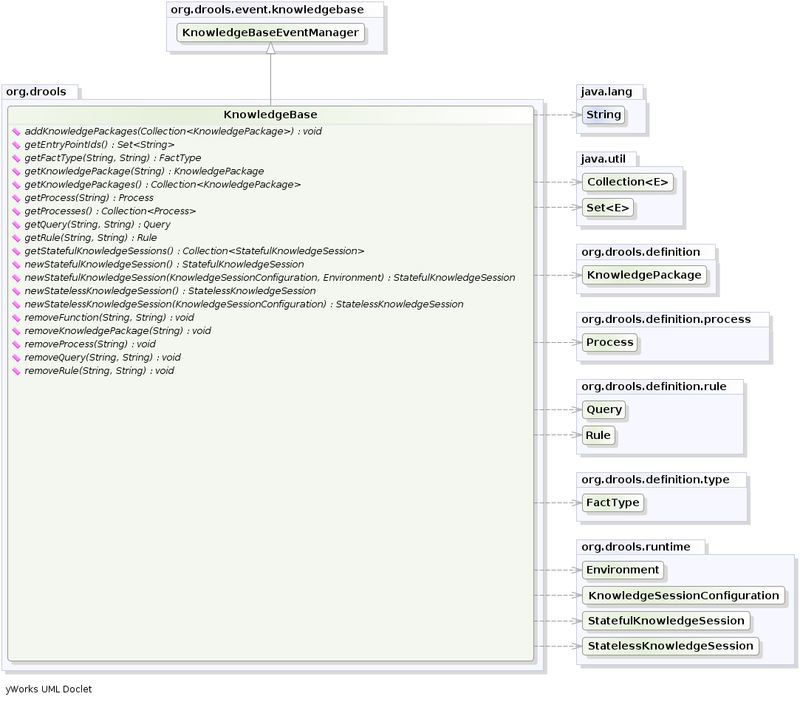 Spring and Camel, covered in the integrations book, facilitate declarative services. The BatchExecutionHelper provides a configured XStream instance to support the marshalling of Batch Executions, where the resulting XML can be used as a message format, as shown above. Configured converters only exist for the commands supported via the Command Factory. The user may add other converters for their user objects. This is very useful for scripting stateless or stateful knowledge sessions, especially when services are involved. There is currently no XML schema to support schema validation. The basic format is outlined here, and the drools-pipeline module has an illustrative unit test in the XStreamBatchExecutionTest unit test. The root element is <batch-execution> and it can contain zero or more commands elements. This contains a list of elements that represent commands, the supported commands is limited to those Commands provided by the Command Factory. The most basic of these is the <insert> element, which inserts objects. The contents of the insert element is the user object, as dictated by XStream. The insert element features an "out-identifier" attribute, demanding that the inserted object will also be returned as part of the result payload. It's also possible to insert a collection of objects using the <insert-elements> element. This command does not support an out-identifier. The org.domain.UserClass is just an illustrative user object that XStream would serialize. Next, there is the <set-global> element, which sets a global for the session. <set-global> also supports two other optional attributes, out and out-identifier. A true value for the boolean out will add the global to the <batch-execution-results> payload, using the name from the identifier attribute. out-identifier works like out but additionally allows you to override the identifier used in the <batch-execution-results> payload. There is also a <get-global> element, without contents, with just an out-identifier attribute. (There is no need for an out attribute because retrieving the value is the sole purpose of a <get-global> element. While the out attribute is useful in returning specific instances as a result payload, we often wish to run actual queries. Both parameter and parameterless queries are supported. The name attribute is the name of the query to be called, and the out-identifier is the identifier to be used for the query results in the <execution-results> payload. The <start-process> command accepts optional parameters. Other process related methods will be added later, like interacting with work items. Support for more commands will be added over time. The MarshallerFactory is used to marshal and unmarshal Stateful Knowledge Sessions. However, with marshalling you need more flexibility when dealing with referenced user data. To achieve this we have the ObjectMarshallingStrategy interface. Two implementations are provided, but users can implement their own. The two supplied strategies are IdentityMarshallingStrategy and SerializeMarshallingStrategy. SerializeMarshallingStrategy is the default, as used in the example above, and it just calls the Serializable or Externalizable methods on a user instance. IdentityMarshallingStrategy instead creates an integer id for each user object and stores them in a Map, while the id is written to the stream. When unmarshalling it accesses the IdentityMarshallingStrategy map to retrieve the instance. This means that if you use the IdentityMarshallingStrategy, it is stateful for the life of the Marshaller instance and will create ids and keep references to all objects that it attempts to marshal. Below is he code to use an Identity Marshalling Strategy. For added flexability we can't assume that a single strategy is suitable. Therefore we have added the ObjectMarshallingStrategyAcceptor interface that each Object Marshalling Strategy contains. The Marshaller has a chain of strategies, and when it attempts to read or write a user object it iterates the strategies asking if they accept responsability for marshalling the user object. One of the provided implementations is ClassFilterAcceptor. This allows strings and wild cards to be used to match class names. The default is "*. *", so in the above example the Identity Marshalling Strategy is used which has a default "*. *" acceptor. Note that the acceptance checking order is in the natural order of the supplied array. 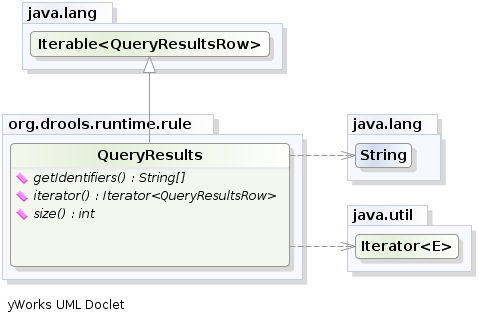 Longterm out of the box persistence with Java Persistence API (JPA) is possible with Drools. You will need to have some implementation of the Java Transaction API (JTA) installed. For development purposes we recommend the Bitronix Transaction Manager, as it's simple to set up and works embedded, but for production use JBoss Transactions is recommended. Drools Clips is an alpha level research project to provide a Clips like front end ot Drools. As of Drools 5.2 this module as stopped working, we will try and fix for 5.3. Deftemplates are working, the knowledge base handles multiple name spaces and you can attach the knoweldge base to the session for interative building, to provide a more "shell" like environment suitable for Clips. This project is very early stages and in need of love. If you want to help, open up eclipse import api, core, compiler and clips and you should be good to go. The unit tests should be self explanatory.